Yesterday, it was pretty wonderful to see all the photos that people posted on Twitter with the #mentalpatient hashtag. The main point of these pictures was to show that mental illness is (mostly) invisible and that we look like a diverse collection of individuals, like a collection of people. Which is what we are. Except, with anorexia, that's not always true. Our mental health is illustrated in our bodies, the size of our limbs or the flesh on our cheeks. Some of the pictures posted on Mind's and Time to Change's twitter feed showed significant events in people's lives, achieved while living with mental health difficulties. And I considered posting a photo from my PhD graduation, which took place about 8 weeks into my 5th adult inpatient admission for anorexia and a few days after my section was lifted in the ward round. 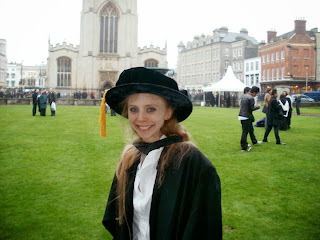 That photo shows that instead of wielding a cleaver or wearing an orange jumpsuit, this #mentalpatient was given her doctorate in a ceremony at Senate House. Trouble is that the photos show an ill person. Like lots of (but not all) other people with eating disorders, I struggle with perceiving what I look like in the present moment. Numerically speaking, in terms of BMI or kilos, professionals can define me as underweight when all I can see is the fat on my body and the size of my fat face. On one level, I understand the metaphor used by my eating disorders psychiatrist of colour blindness, that I need to accept that my red is green or my green is red in order not to crash when I am in the world at metaphorical traffic lights (! ); but the truth is that real emotional belief is lacking and I am aware only of my largeness. On day of my PhD graduation, I wasn't aware that I looked pale and (probably) a bit underweight but I can see with hindsight that other people might have seen illness in my appearance and therefore I posted a photo of knitted poodles instead of me! Today, with time to think and to look at the photographs objectively, I've found one where I think I look ok. I think (hope) that this is not the sort of photo that would be triggering to anyone else with an eating disorder (which is another horrible can of worms when trying to be a positive online presence yet facing very real every day struggles with anorexia). It shows my reality. The reality of living with an illness for most of my life, yet living my life anyway. The reality of multiple hospital admissions ... and multiple degree graduation ceremonies. Nonetheless, I'm rather delighted that my knitted poodles have been so popular and have gained their own twitter fans. Given that they are still a standing joke at my EDU, 10 years after the craze first took hold of us all and 5 years after the move to a new building with the demolition of QEPH, it's good to know that they have their admirers. The dietitian who greeted me a couple of years ago with "please don't start another infestation of poodles" will probably never be among them!